There are several functions on the Classroom Dashboard. Get Course Gallery Link: This provides a link to each Course's Gallery. Students in the Course may submit decks to their Course Gallery which is a page that the account holder can use for viewing all student's work in one place. This link is only available to the educator, but if you choose to share it others with the link may view all decks that have been submitted to that Classroom Gallery. If you don't want students to see other students' work, do not share this link. Delete Course: This button deletes the course and removes student accounts associated with it. Please be aware that when you do this, students associated with the Course may lose privileges that come with the Haiku Deck Classroom subscription. These include the ability to create an unlimited number of Haiku Decks, make decks private, the ability to download/export decks, the ability to embed YouTube videos in their presentations, etc. No changes will be made to existing decks, so decks that were made private before deleting a student account will remain private. More on that here. Status: This column shows whether or not students have accepted their invitation to the app. 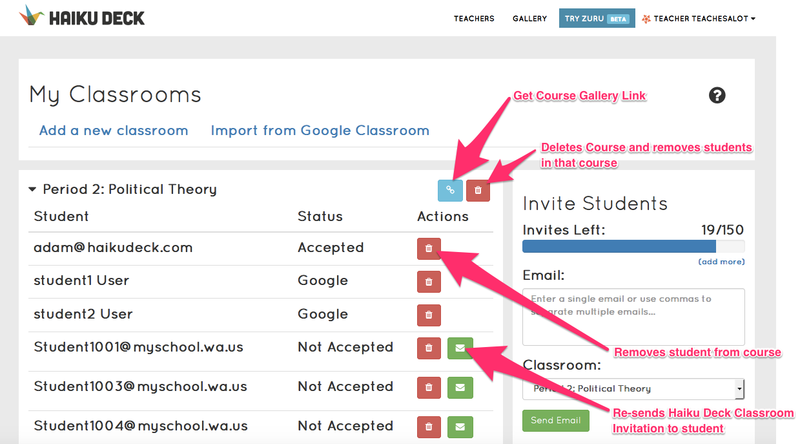 Resend: This button allows the educator to resend an invitation to a student to join the Course. Remove: This button removes students from the Course.